Confession time…. In 1991, I really liked Marky Mark and the Funky Bunch. I was a stupid teenager and didn’t know any better. Then a few years back, my wife and I were trolling around New York City and ran into one of his stagehands that said he’s the coolest guy in the world until you call him “Marky Mark”. This movie makes you want to hang out with Mark Wahlberg. “2 Guns” is the story of what can happen when three government agencies with rogue personnel get greedy and try to steal money from drug dealers. If you’ve followed the news, this may sound a little bit like art imitating life, but this is nothing like the “Fast and Furious” gun running scandal that has mired the real United States Department of Justice. Denzel Washington plays Bobby Trench, a DEA officer who is deep under cover, who just happens to be setting up a Naval Intelligence Petty Officer, Michael “Stig” Stigman (Wahlberg). Neither man knows that the other is an agent of the United States government, attempting to ferret out a major international drug smuggling ring run by Papi Greco (Edward James Olmos). They realize they are both on the same “team” after they rob a bank in a sleepy border town, attempting to steal $3 million from Greco’s safe deposit box. When they end up with $43 million, they have not only the cartel on their posteriors, but also a rogue CIA agent, who has been assisting the cartel for decades. I’ve enjoyed Denzel Washington for years. He’s grown as an actor and is incredibly versatile. 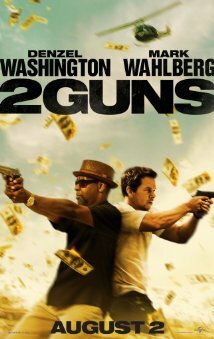 This “buddy cop” style movie was not only full of action, but also the witty dialogue between Wahlberg and Washington was absolutely priceless. Washington came across as the, “I’m getting too old for this stuff” cop, while Wahlberg accurately portrayed the younger sailor that would get his socks knocked off in an explosion and then scream about how awesome it was. This is a movie that you probably have to watch twice to catch all of the little things. Is it worth two trips to the theater? Probably not. Is it worth a trip to the theater and then renting? Absolutely.